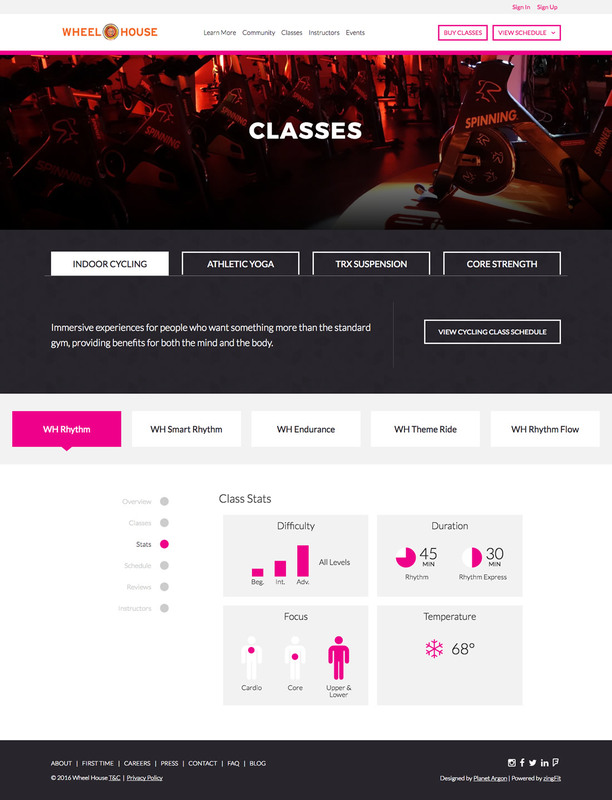 A site redesign to mirror the energy of the fitness studio experience and inspire users to take their health to the next level. When the San Francisco-based yoga, core strength, and indoor cycling studio Wheel House approached us, they already had a live website. However, it was facing some major UX issues and customers were complaining. They found the scheduling tool cumbersome, had difficulty finding information on the types of classes, and onboarding for first-time users was nonexistent. Potential customers were getting lost on the website, or worse, abandoning the site altogether. In addition, the site lacked a cohesive branding style and was dull compared to the competition. Our challenge was to provide an engaging experience by identifying a clear branding style, simplifying the transactional process, and guiding customers through onboarding. All of the moving parts also needed to integrate with ZingFit, a third party scheduling platform. While Wheel House had a rough wireframe to explain their vision, we wanted to understand the goals they had for themselves and their users. Our discussions began with a discovery meeting to identify the who’s, what’s, and why’s. This allowed us to use their ideas not only as a starting point but as a reference throughout the redesign. Following the kickoff, we launched into design strategy to reassess the workflow and information provided to customers. We created custom headers that showed upcoming classes. Customer accounts now display their remaining balance and even pull in discounted prices on the buy page if a group discount is available — both of which were not possible on ZingFit’s platform alone. Along with this upgraded functionality, we created a new, one-stop onboarding section that organized the FAQ, class information, and sign-up process for new customers. All of this was done within a more vibrant, visual, and impactful design that embodied the in-person experience at Wheel House's San Francisco studio.